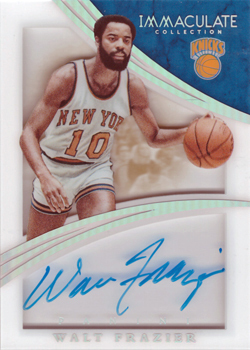 Basketball card auctions on eBay constantly appear to be littered with the phrase "1 of 1". 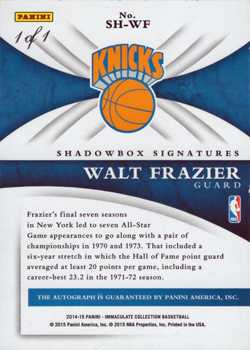 Sellers use the phrase to describe almost any serial numbered autograph or memorabilia card. Invariably it is used to describe the first, last and jersey number of the player. So for LeBron James cards numbered 1 of 25, 25 of 25, and 23 of 35 are ridiculously all listed as "1 of 1" cards. Taken to its logical conclusion ALL serial numbered, autograph, or patch memorabilia cards are going to be unique...so could be regarded as '1 of 1" cards!!! So the card collecting hobby now has the term a 'true 1 of 1'. Two such cards [pictured above] formed part of my recent delivery of cards from the 2014-15 Immaculate release; namely the Shadowbox Signatures - Platinum cards of Hall Of Fame legends Alex English & Walt Frazier. 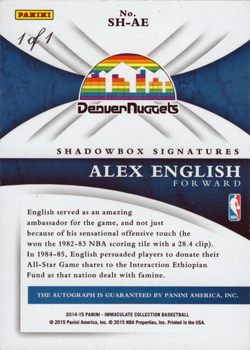 I have previously mentioned that I had been been very impressed by the initial images of the Shadowbox Signature cards posted by Panini, which in turn led to the decision that I should attempt to put together the complete 71 card set. What I had no initially realised that there were two parallel (Gold serial numbered to ten and the Platinum 1 of 1) versions. Whilst I have no intention of chasing these more seriously, I was pleasantly surprised that I was able to pick these two up at a pretty reasonable price. The bonus, is that they are the first 'true 1 of 1' cards that I now have in my collection.